Wynn Resorts' stock has been on a roll in 2017, but these risks are worth keeping an eye on. Wynn Resorts Limited (NASDAQ:WYNN) has had a great year so far on the stock market, climbing over 52% on the back of strong growth in Macau and solid performance at the new Wynn Palace. But there are some risks for investors following the stock's rise in price. Macau has already started to show some signs of weakness and debt is starting to become a bit of a concern. These are the risks I'm most concerned about in Wynn Resorts' stock. Macau's gaming revenue grew 26% year over year in June, but it was actually down sequentially, stoking fears that Macau's days of double-digit growth may be coming to an end. Macau is the single biggest driver of Wynn Resorts' stock and gaming stocks in general, but right now is a critical time for Macau because it's absorbing a flood of new capacity. Wynn Palace and Las Vegas Sands' (NYSE:LVS) The Parisian opened last year, Studio City from Melco Resorts (NASDAQ:MLCO) opened in 2015, and MGM Resorts (NYSE:MGM) will open a new resort on Cotai next year. The new supply has to be accompanied by growth in demand or the resorts will cannibalize each other. Since the middle of 2016, the region has grown enough to more than account for the new supply. But if growth slows, or Macau's gaming market shrinks, it'll be the biggest driver of Wynn's stock falling. Could Wynn Resorts lose its place in Macau? One risk that's currently unappreciated by the market is the fact that Wynn's gaming license in Macau will soon need to be renewed. Wynn signed its gaming concession in 2002, and its 20-year agreement means that it will need to be extended or otherwise renewed in 2022. Macau's government has yet to lay out how that process will even take place, but if Wynn lost its gaming license, the stock would crash. Until we know how gaming licenses are going to be handled after 2022, it's hard to assess how big the risk is to Wynn Resorts. But Macau accounts for most of Wynn's revenue and EBITDA, and after investing $4.4 billion on Wynn Palace, there's a lot on the line for Wynn Resorts. Over the last five years, Wynn Resorts' debt has exploded, primarily because it took out debt to fund Wynn Palace's construction. And it's building the $2.4 billion Wynn Boston Harbor and planning to spend another $500 million to construct an addition in Las Vegas next year. 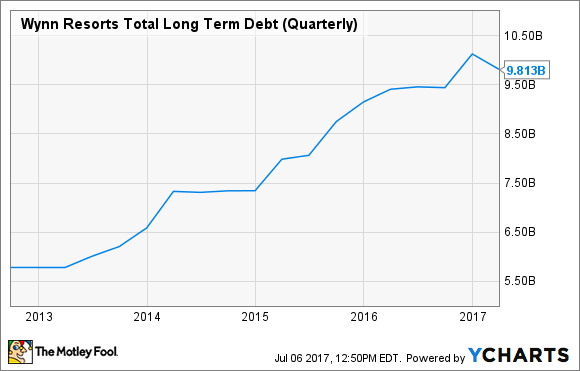 WYNN Total Long Term Debt (Quarterly) data by YCharts. The spending puts a strain on the balance sheet that increases bankruptcy risk if Macau or Las Vegas see revenue decline. Remember, gaming companies went bankrupt in the financial crisis because they had so much leverage they couldn't handle the revenue hit from the recession. Debt could be growing at the wrong time for Wynn, too. Japan is expected to open up to gaming bids in the next year, and if Wynn can't afford to spend $5 billion to $10 billion constructing a casino there, it could miss out on a golden opportunity. Rising debt isn't the likely driver of Wynn's stock falling, but it can exacerbate factors like declining revenue in Macau or weak results in Las Vegas. And it's worth making sure Wynn is keeping a conservative balance sheet because it's risky to bet too big on the gaming industry with borrowed money.